This chic three quarter sleeve sheath dress is a great flattering little black dress for nearly any event. The Isabel Lace Sleeve Sheath Dress is lined at the bust. It has a V neckline, empire waist, and a classic sheath cut. The best part of this dress has to be the semi-sheer there quarter lace sleeves. A pocket on each side of the skirt adds a laid-back touch to this look. A hidden back zipper completes this dress. The Isabel Lace Sleeve Sheath Dress looks perfect paired with black or beige pumps and jewelry. Or punch it up with an unexpected pop of color! Details: Made in USA. Lined at bust. Hidden back zipper. 95% polyester, 5% spandex. Contrast: 100% nylon. Lining: 100% polyester. Hand wash cold or dry clean. Small measurements: Length from top of shoulder to hemline: 36". Bust: 30". 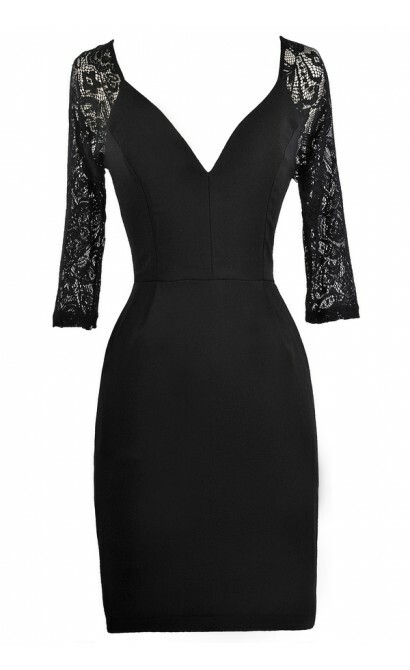 You have added Isabel Lace Sleeve Sheath Dress in Black into Wishlist. You have added Isabel Lace Sleeve Sheath Dress in Black for Stock Notification. 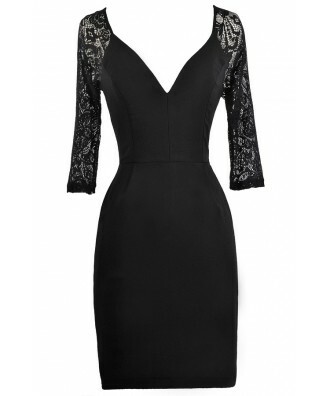 You have set Isabel Lace Sleeve Sheath Dress in Black as a loved product. You have removed Isabel Lace Sleeve Sheath Dress in Black as a loved product.